Enjoy a comfy bed and buffet breakfast for just SGD172 (USD140) per night at the Ibis Hotel on Bencoolen in Singapore. The quoted price is for a Standard Room and includes free Internet access and breakfast for up to two adults at Taste Restaurant. A 10% service charge and 7% local taxes are additional. The “Shopping Spree Promotion” is available until December 31, 2012. The quoted price is the lowest available during the promotional period and will be higher during peak times. This promotion requires full pre-payment by credit card and no changes or cancellations are permitted. 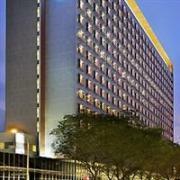 The Ibis Hotel on Bencoolen is a 3-star hotel located in downtown Singapore. Standard Rooms are furnished with your choice of one queen or two twin beds plus LCD TV with international channels, high-speed internet access, an electronic safe, coffee/tea making facilities, and a modern bathroom with shower. Visit the official Ibis Hotel on Bencoolen website for more information or to make an online booking. The hotel can be contacted by calling (65) 6593 2888.